Please refer to our stock # 1845 when inquiring. Sold. Thank you Mr & Mrs B for your art patronage and for helping the Andover Historical Society continue to make art and history possible! This latest small landscape painting titled "Vibrant View From The Addison" as seen across the street from The Addison Gallery of American Art Museum on the grounds of Phillips Academy can be viewed at the Andover Historical Society "Places" juried art show from 09/09/17 through 12/22/97. This is signed by this self learned painter as Mimi Dee at lower left and is housed in a hand painted frame by same. Image: 5 X 7" - a perfect fit for that small office space or dorm room! 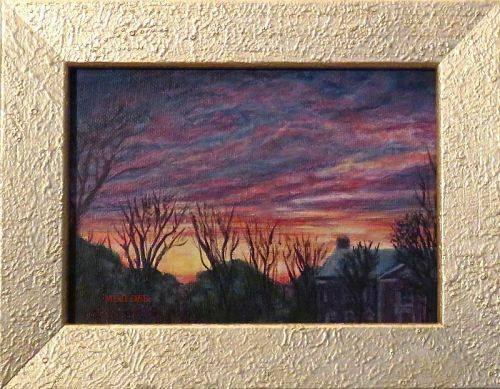 Frame: Gesso textured and painted by the artist - 7 1/8 X 9 1/8"
Places / Location: As seen from the Addison Gallery of American Art Museum on the grounds of Phillips Academy on a late Autumn or Early Winter day at dusk. Original work by this self learned multi media artist who also forges sterling silver metal work studio jewelry and constructed fiber art to wear, has been exhibited in various area artist association shows since the 90s and at the previously open Methuen studio store gallery by the same name.